Segovia, a Day Trip from Madrid and a World Away – travelographie. 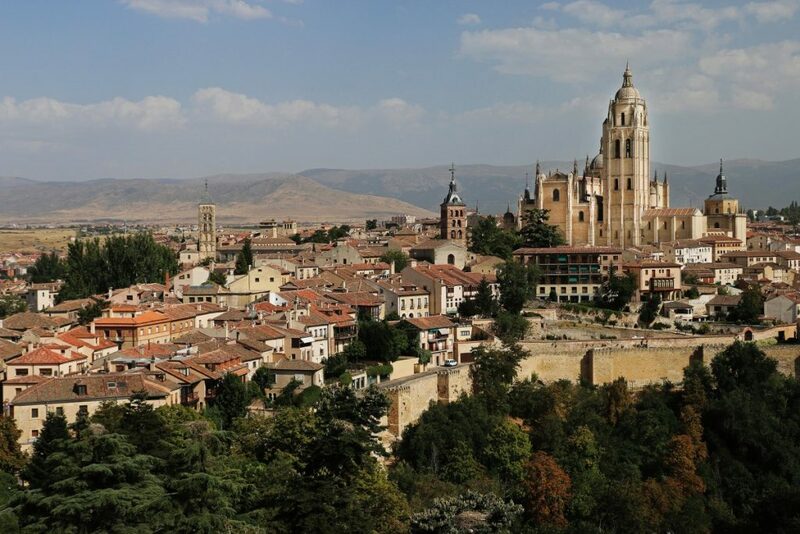 Segovia is just over 50 miles away from central Madrid and a world apart. The UNESCO world heritage city has a historic downtown set against the backdrop of a Roman aqueduct, a gothic cathedral, and soaring fortress called El Alcázar, which is said to have inspired Disney’s Cinderella castle. By car, Segovia is about an hour and a half from central Madrid. 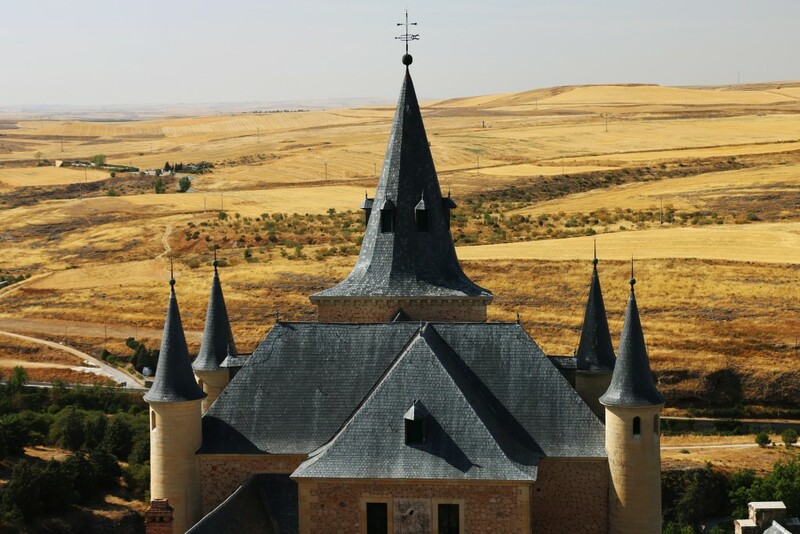 The road to Segovia races through barren stretches of arid plains before ascending the mountains that form the backdrop to the medieval city. For a single-day trip to Segovia from Madrid, however, traveling by train is convenient – and fast. The AV tren (Alta Velocidad, or high-speed) train goes up to 250 km/hr takes just 28 minutes. 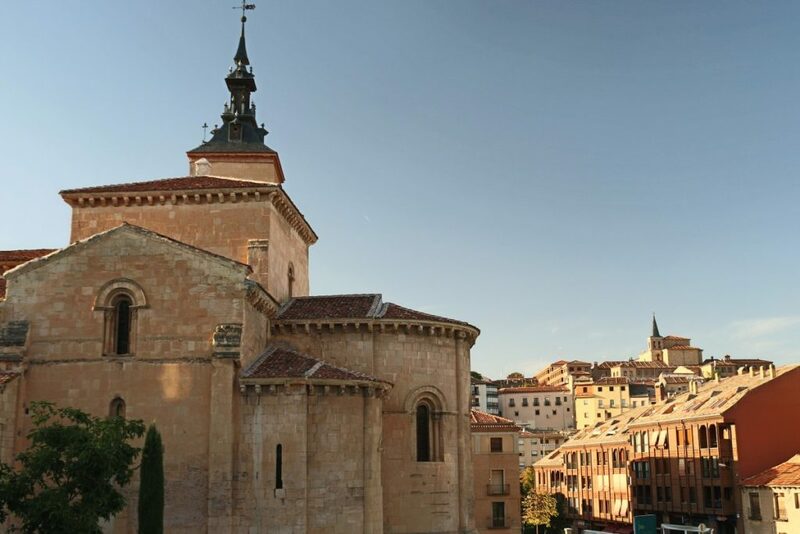 It departs from Madrid’s northern Chamartín (not Atocha) station and arrives at Segovia’s AV station, which is called Segovia-Guiomar and is located about ten minutes outside of town. Buses are timed to pick up passengers who have arrived on the AV train and take them straight to the historic downtown. Taxis are also available and cost 7–8€. Depending on how large your group is, it may be cheaper to take a taxi, as the bus costs 2€ for a one-way trip (2016). 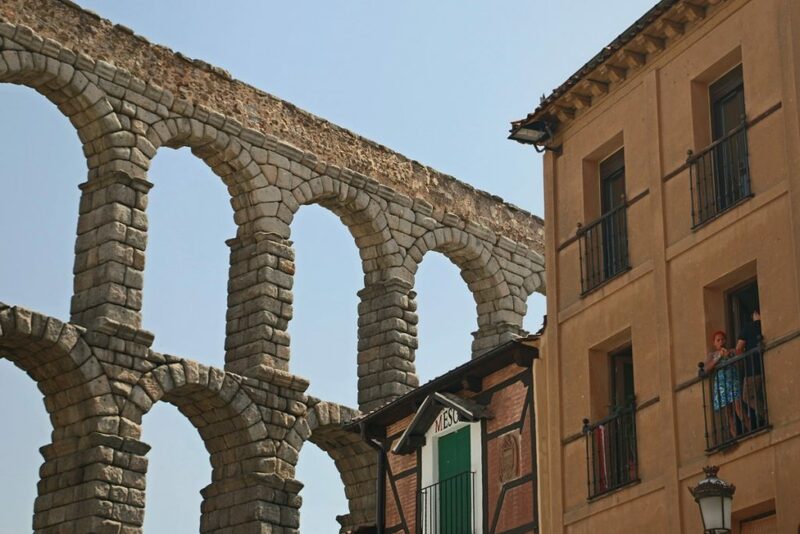 From the bus stop, it is a pleasant walk to the Plaza de Azoguejo and the Roman aqueduct at the edge of the old town. 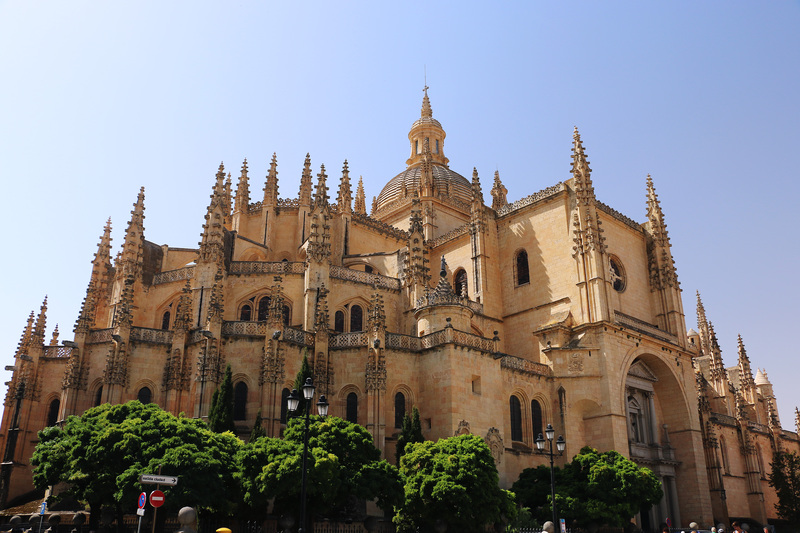 On the way, you will get a view of Segovia’s charming rooftops and churches. 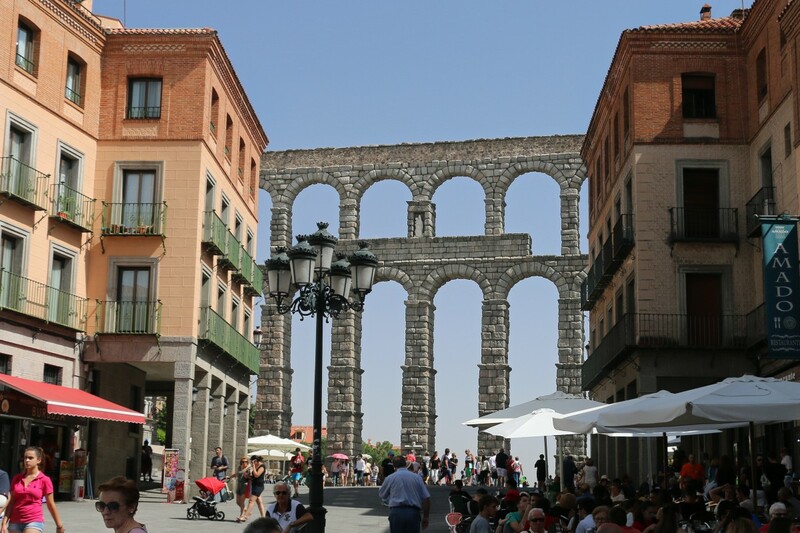 The Roman aqueduct of Segovia dates to the first century CE. 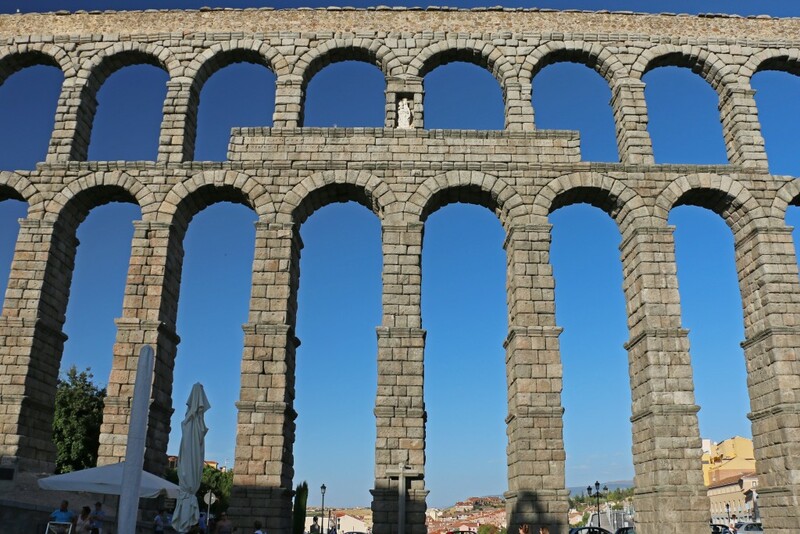 It’s a two-tiered construction over 800 meters long, and Segovia’s is one of the best preserved Roman aqueducts in Europe. This feat of ancient civil engineering has been described as one of the most “solemn testaments” to the legacy of the Roman Empire in Spain. The construction of the aqueduct is perhaps even more impressive given the fact that the granite blocks, each of which weighs hundreds of pounds, were hauled from the mountains in the distance. They were then fitted together without mortar. At its highest point, the Segovia aqueduct reaches 29 meters, or about the height of a five-story building. 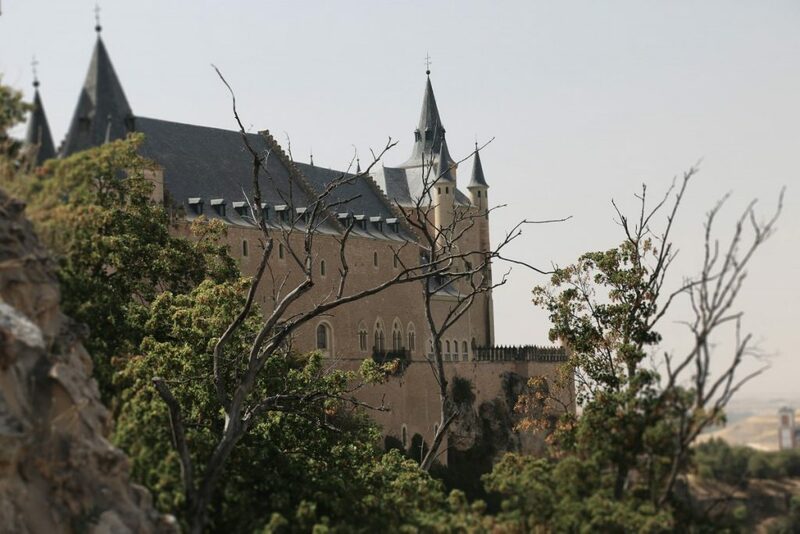 Though the city attracts many tourists and day-trippers from Madrid, Segovia has a sleepy, laid-back feel, with a long siesta period around 2:30–5:30 PM, when the city virtually shuts down and its residents return home for a meal and rest during the height of the midday heat. 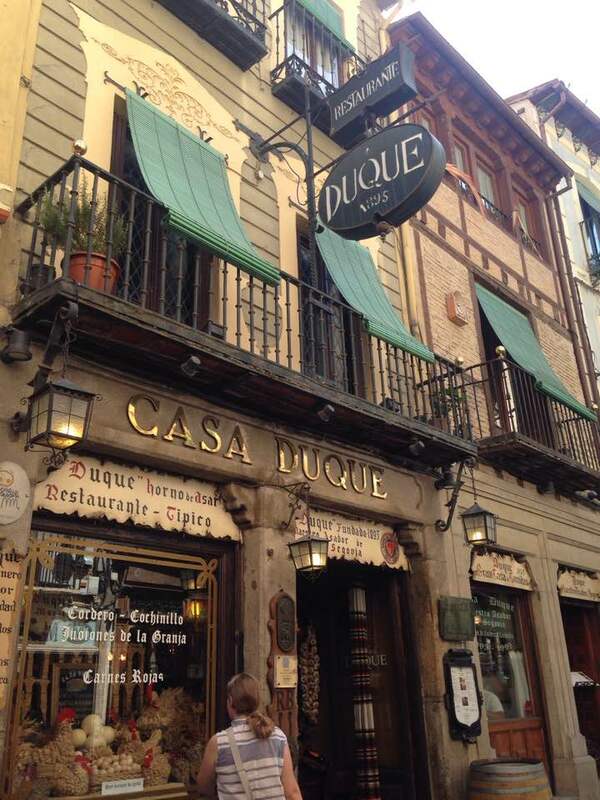 Though Segovia is certainly dependent on the tourist industry and its UNESCO cachet, it’s still a place where its residents seem to abide the rhythm of traditional Spanish life. Directly across from the aqueduct, a subdued shopping street leads into the old city of Segovia and the iconic fortress El Alcázar. 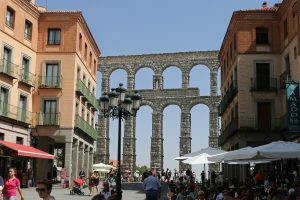 Segovia was first settled by the Celts in the first century AD. It was then conquered by the Romans, and later the Moors, who recognized the area’s strategic importance at the confluence of the rivers Ciguinuela and Eresma. It was taken back during the Reconquista in 1088 and soon became a city of great economic and political importance. These layers of history are built into the city’s architecture: El Alcázar, for instance, was constructed upon an old Moorish military outpost (the name comes from the Arabic el qasr, meaning fortress), and the city walls were built with gravestones repurposed from Roman cemeteries. Segovia became a thriving economic center from the late Middle Ages to the early Renaissance period. Trade united Christians, Jews, and Moors together, giving the city a long-standing multicultural spirit. The Jewish Quarter is contained along the city’s southern wall, and the stately former residence of Abraham Seneor, an influential liaison between the Jewish community and Catholic rulers prior to the expulsion, houses a small but interesting museum of Jewish history. 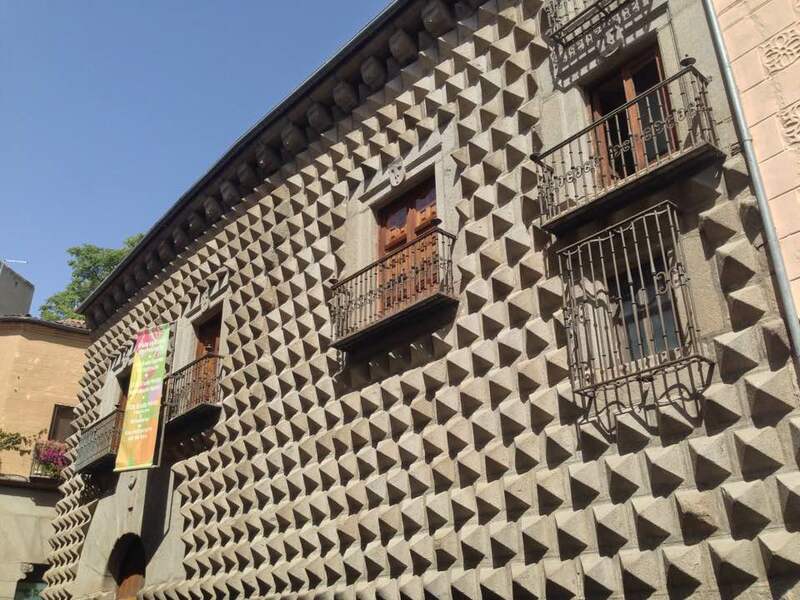 This spirit of multiculturalism – and cultural tension – is also embodied in the architecture o f one of the city’s most unusual landmarks: the Casa de los Picos, or the pointed house. It had been the property of a wealthy Jewish merchant before the expulsion, and when Spanish dramaturge Juan de la Hoz acquired it in 1500, he retrofitted it with the spiky exterior to mask its Jewish origins. Today, it contains a small museum and a design school. Past the Casa de los Picos is the Plaza Mayor, the main square in the old town. This is a good place to stop for a coffee or ice cream at one of the many cafes and take in a view of Segovia’s sixteenth-century cathedral, a marvel of late Gothic architecture. Though the architectural style had gone out of fashion elsewhere in Europe by the time of its construction, the aesthetic appears today to be timeless. 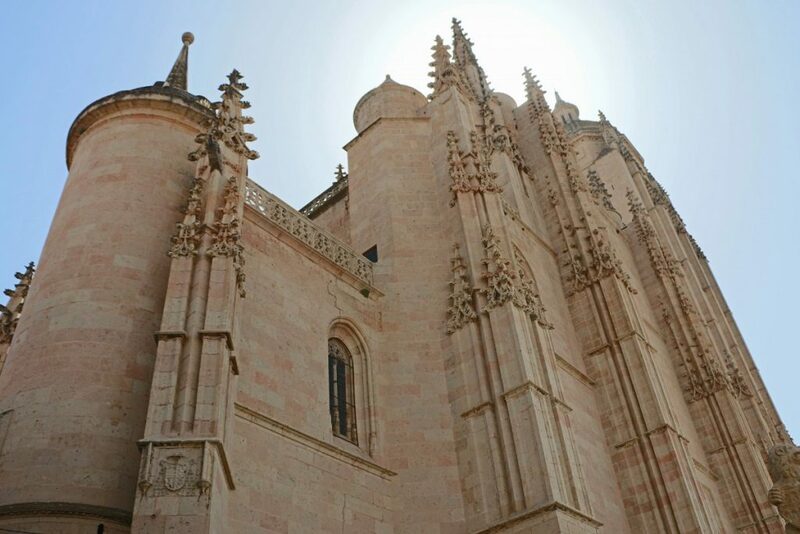 The light granite and sandstone of the Segovia cathedral soak up the sun, and the building gives off a warm glow, translating heat into light. I got an audio guide to learn about each of the 22 rooms of the castle of El Alcázar included in the tour. If you speak Spanish, there are also guided tours throughout the day. At the front of the fortress is an enormous tower, which served as both a defensive structure and prison. I climbed up the 156 steps to the top for a view of the castle and the ochre sea of the surrounding plains. 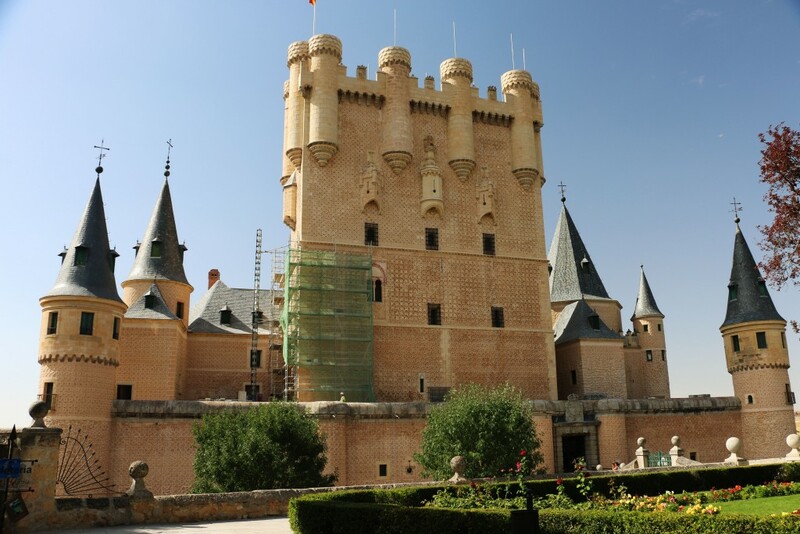 Today, Segovia’s El Alcazar is a museum and artillery college, but as a military fortification, it was one of the only fortresses in Europe to never have been taken by enemy invaders. While its formidable construction did succeed in holding off enemies, ironically, the castle was nearly destroyed from within when a fire ravaged the palace in the 19th century. 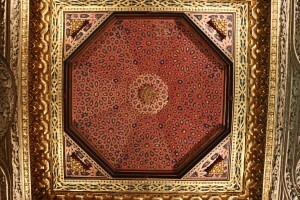 Unfortunately, most of the original furnishings and ceiling ornamentation were lost in the 1862 fire. 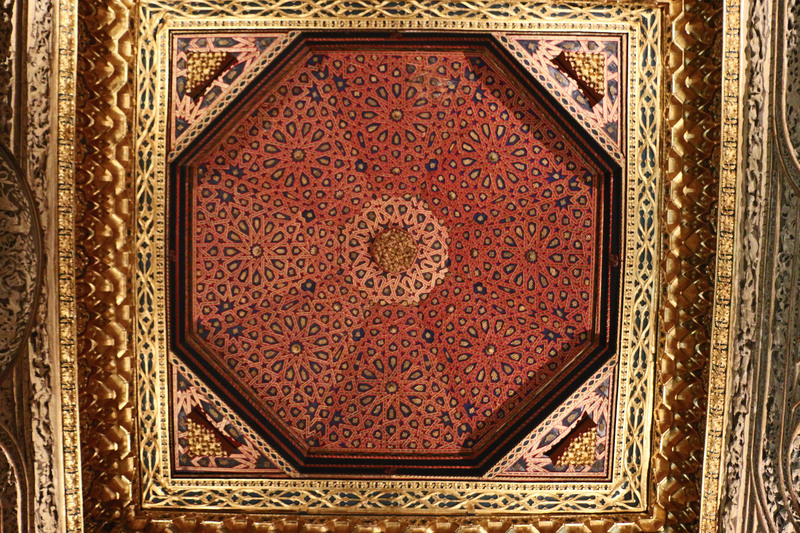 But as luck would have it, extensive drawings and records housed elsewhere allowed the rooms to be restored to something approximating their original splendor, like this Arabesque ceiling. One of the most compelling reasons to visit Segovia, beyond its grand architecture and history, is its enigmatic atmosphere. When the streets empty of all life each afternoon during the siesta, Segovia takes on an eerie, deserted feel, where not even the wind moves. The sun is the only presence, radiating the city in a relentless heat. When emptied of the comings and goings of modern life, Segovia slips back into its history and the sun reigns over a different time.